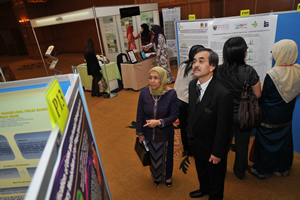 KUALA LUMPUR, 30 Nov. 2010 – R&D output will be brought to the market during the second phase of the National Biotechnology Policy to be implemented over the next five years. This follows the success of the first phase of the policy launched in 2005, involving Capacity Building through the creation of home-grown biotechnology companies that can take up research outputs from research institutions. Minister for Science, Technology and Innovation, Datuk Seri Dr Maximus Johnity Ongkili said to date over 100 new biotech companies have been formed to carry out the measures. 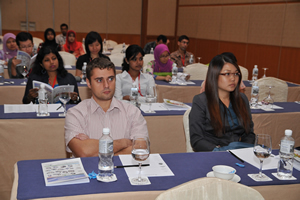 He was opening the Asian Regional Conference on Systems Biology 2010 here today. 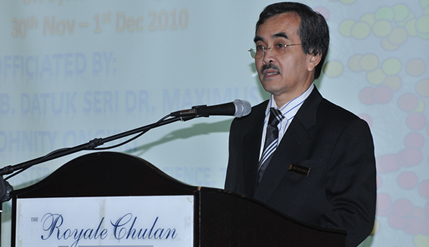 The minister’s speech at the conference organised by the Institute of Systems Biology (INBIOSIS), Universiti Kebangsaan Malaysia (UKM), was read by the Director General Malaysian Genome Insitute, MOSTI, Professor Emeritus Dr Nor Muhammad Mahadi. The minister said that bringing R&D output to the marketplace do not mean that Capacity Building is downgraded. In fact the biotechnology value chain must be pump-primed by intensifying research that can lead to more discoveries. He congratulated UKM for setting up the Institute of Systems Biology which focuses more on microbial and plant systems biology. “It is a very brave and ambitious undertaking. From Malaysia’s perspective this is a wise strategy as this focus will create new and more opportunities in industrial and agricultural biotechnology,” he said. Dr Ongkili said the National Innovation Model developed by the ministry, incorporates innovations from the outputs of R&D in molecular biology, genomics and systems biology and are regarded as technology-driven innovation approach for business development. MOSTI, he said, will do its best to promote and create opportunities for R&D in both bioinformatics and computational biology since systems biology are dependent on them. “We will start with a special programme in genome informatics in collaboration with a renowned research institute in genomics and molecular biology from our region. “To create a global presence in biotechnology by 2020 the government is also promoting biotechnology investment from abroad. BioXcell in Iskandar Malaysia in Johor has attracted a number of biotechnology companies to re-locate their operations to Malaysia. “Similarly, a number of companies from India are investing in the Melaka BioCity,” he added. Director of INBIOSIS who is also the Chairperson for the conference, Prof. Dr Normah Mohd Noor said the conference will focus on current advancements in biology, mainly on the role of biology in the era of integrative science. UKM, she stressed is the first university in Malaysia which has placed systems biology as the best research approach in modern biotechnology research that takes a systems perspective. The Institute of Systems Biology is pioneering this rich new opportunity in Malaysia. INBIOSIS was established on 1st July 2005 consolidating all the existing expertise within three research centres namely Centre for Gene Analysis and Technology (CGAT), Centre for Plant Biotechnology (CPB) and Centre for Bioinformatics Research (CBR). The three research centres, she said, had strengthened UKM as an established and successful modern biotechnology research university.